extensive damage first to the southern and later to the northern part of town. 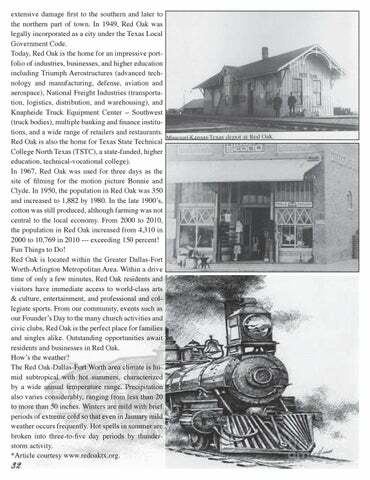 In 1949, Red Oak was legally incorporated as a city under the Texas Local Government Code. Today, Red Oak is the home for an impressive portfolio of industries, businesses, and higher education including Triumph Aerostructures (advanced technology and manufacturing, defense, aviation and aerospace), National Freight Industries (transportation, logistics, distribution, and warehousing), and Knapheide Truck Equipment Center – Southwest (truck bodies), multiple banking and finance institutions, and a wide range of retailers and restaurants. Red Oak is also the home for Texas State Technical College North Texas (TSTC), a state-funded, higher education, technical-vocational college). In 1967, Red Oak was used for three days as the site of filming for the motion picture Bonnie and Clyde. In 1950, the population in Red Oak was 350 and increased to 1,882 by 1980. In the late 1900’s, cotton was still produced, although farming was not central to the local economy. From 2000 to 2010, the population in Red Oak increased from 4,310 in 2000 to 10,769 in 2010 --- exceeding 150 percent! Fun Things to Do! Red Oak is located within the Greater Dallas-Fort Worth-Arlington Metropolitan Area. Within a drive time of only a few minutes, Red Oak residents and visitors have immediate access to world-class arts & culture, entertainment, and professional and collegiate sports. From our community, events such as our Founder’s Day to the many church activities and civic clubs, Red Oak is the perfect place for families and singles alike. Outstanding opportunities await residents and businesses in Red Oak. How’s the weather? The Red Oak-Dallas-Fort Worth area climate is humid subtropical with hot summers, characterized by a wide annual temperature range. Precipitation also varies considerably, ranging from less than 20 to more than 50 inches. Winters are mild with brief periods of extreme cold so that even in January mild weather occurs frequently. Hot spells in summer are broken into three-to-five day periods by thunderstorm activity. *Article courtesy www.redoaktx.org.